The Valentine’s Day sunrise threw rainbow flames over the East Bay. I caught a glimpse of the light show as I drove and, although I was running behind schedule, I made a u-turn at the nearest pullout on Mt. Tam’s Panoramic Highway and headed back to the opening between the conifer branches from whence I had glimpsed that ferocious light and color. I knew this delay could greatly decrease my chances of finding a good – and free – place to park in San Francisco. And, I worried that the mad dash across the road might be the only running I’d do that day if a car came around the blind curve nearby and did me in (before I could do myself in, but more on that later). But, these risks were outweighed by compulsion: I had to take a quick photo of the sunlight’s fire splashed across the sky, overwhelming and vanquishing the night. That sunrise was indeed auspicious – an early Valentine’s Day gift – and I quickly posted the photo to Instagram and Facebook sharing the gift with friends and family and letting them know I was on my way to participate in the 2016 Kaiser Permanente San Francisco Half Marathon in Golden Gate Park. It would be a race through the park to the eastern Panhandle back down to the western edge and along the Pacific Coast on the Great Highway and promised to be a beautiful run. But, in my Facebook post, I also mentioned my concern about not preparing for the race as much as I would have liked. Unfortunately, due to a 2-week-long illness, I’d not had a chance to break in my new trainers and the farthest distance I had hiked or walked was 7 miles, way less than the 13.1 miles I planned to walk/jog that morning, in as close to 3 hours as possible. 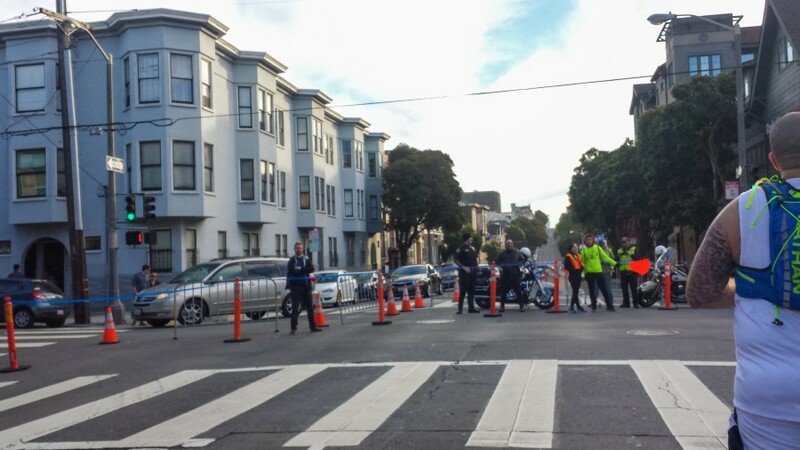 After circling the neighborhood north of Golden Gate Park, I found a parking spot three blocks from the starting line on Balboa and 12th Ave. It’s a great accomplishment to find a free unlimited parking spot in San Francisco on a Sunday morning! So many SF residents are home at that time taking up most of the available parking. The default would have been to pay to park (???$$$!!!) in the underground parking beneath the Academy of Sciences. Free is better in my book unless parking in the City is absolutely impossible. Too often, it absolutely is. But, not today! 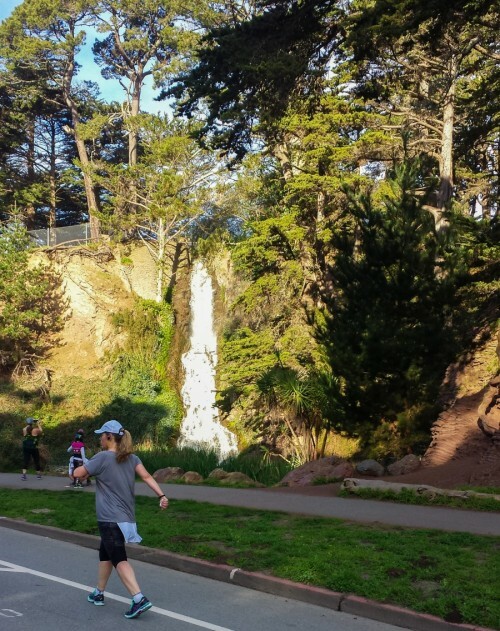 So, already feeling triumphant and in the company of other race participants who parked on the street – many already wearing their race numbers – I found my way to the starting line not far from the DeYoung Museum, one of Golden Gate Park’s many treasures. Pumping music; the palpable anticipation of thousands of runners stretching, jogging in place, adjusting ear buds; and sunbeams reaching down to us through clouds produced a sense of high pre-race jubilation. But, ominously, the twinges of a shin splint were already brewing in the front of my right ankle. The pain was merely mildly distracting at that point, so, even though I knew I would be walking/jogging the entire 13.1 miles in a bit of pain, I quieted the logical, reasonable, and sane voice inside my head asking me to consider not participating, and joined the other back-of-the-pack racers. Here comes the sun! 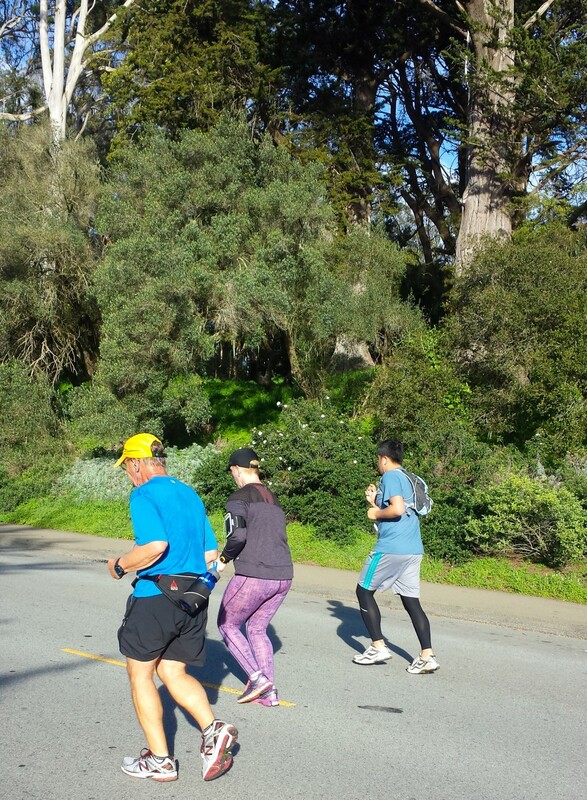 Beautiful day for a race in Golden Gate Park! 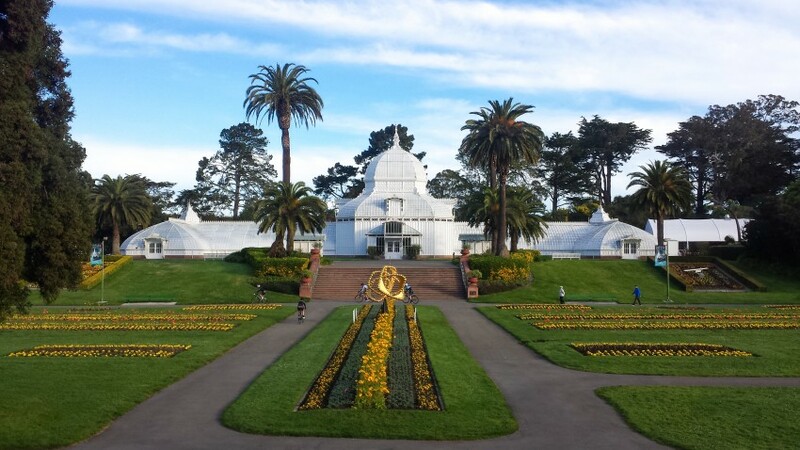 Shortly out of the starting line, I stopped to take a photo of the park’s Strybing Arboretum, its sun-kissed facade just beginning to dazzle amidst the surrounding greenery and golden flowers. Daughter Jacque: Have a blast! See you soon! Daughter’s boyfriend Greg: Go Renate!!! Sister-in-law Kelly: You go girl!!!! back toward the Park and the Great Highway and the Pacific Ocean. The mile 2 marker greeted me along with some encouraging volunteers. My shin splint ached with troubling persistence, but a woman jogging not far from me unwittingly encouraged me when I heard these words from her, “We’ve all got something, don’t we?” She was responding to another runner who had asked how she was holding up and how her leg was doing. We’ve all got something, don’t we? We’ve all got an injury or pain or something we’re struggling through while we continue on. And, the prize is in the continuing on. Again, if others who were hurting could hold steady in this race, so could I. Most of the runners were far ahead by now but there were plenty manning the rear with me, working hard, sweating. 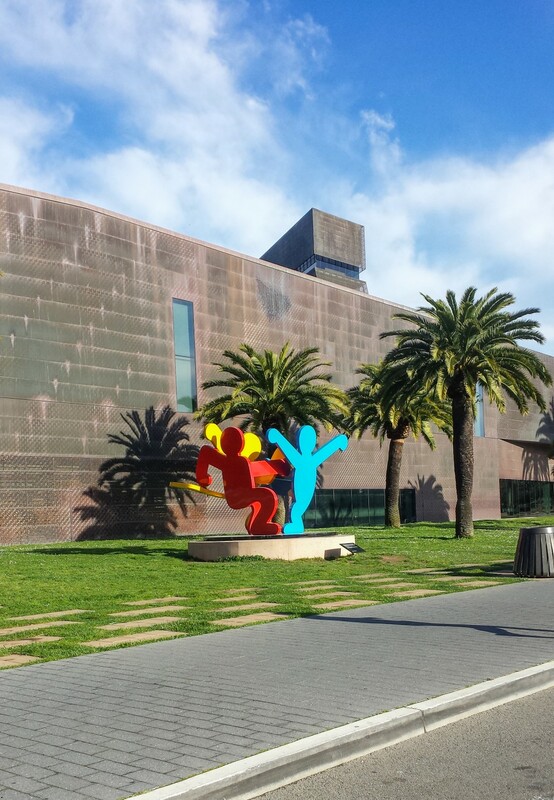 We passed the entrance to the De Young Museum with its dancing statues which inspire movement and freedom and…encouraged me. 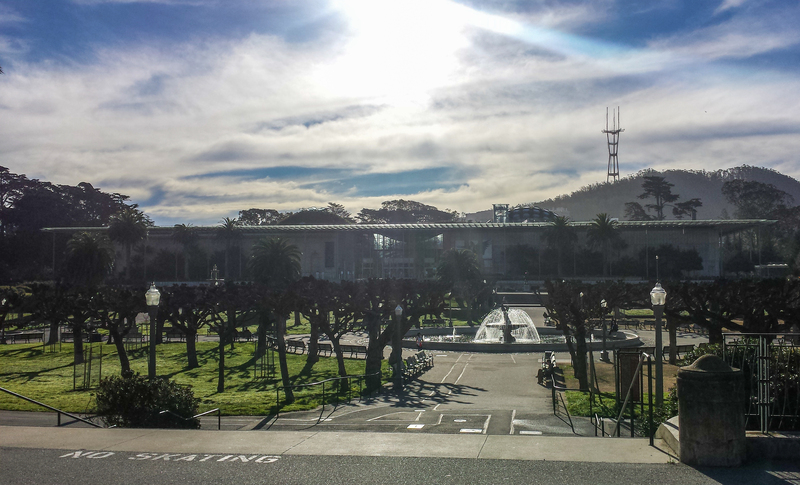 The California Academy of Sciences, situated right across from the DeYoung, has seven museums in one, and they call me back to visit regularly. I saw quite a few racers pause to take a photo of the Rainbow Falls along John F. Kennedy Drive. and on to the Great Highway and Pacific Ocean. Onward to the Great Highway! This was roughly the halfway point and, thus far, the beauty and diversions in the park had kept me from focusing too much on my increasingly sore shin. I had been looking forward to reaching the ocean thinking that on this leg (bad pun) of the race I would have the beauty and rush of the sea to urge me on. But, I’d forgotten that sand dunes separate the Great Highway from Ocean Beach for large swaths. So, what lay before me for the last half of the race was dunes for miles on my right, returning runners on my left, and hard and unforgiving asphalt beneath my feet, and my right shin now began to scream inexorably. The Turn-Around Point (finally!) on the Great Highway! And, at this point, both feet decided to join in the clamor…traitors. Sister-in-law Kristine: That’s a good pace. Keep it up!! We feel ya! Brother: Go Go Go!!!! But Go Slow Slow Slow…..
And, Santiago, the old man who fought a marlin and won…and lost…and yet, perhaps ultimately won, began invading my thoughts. It was during this never-ending Great Highway stretch that I began to seriously question why I was willingly continuing this masochistic exercise. I was not in competition. Nothing was seemingly at stake. And, the pain was so, so great. What was wrong with me anyway??? What was I trying to prove??? I was acutely aware that most of the runners had finished the race by this time, but I tried not to think about it. 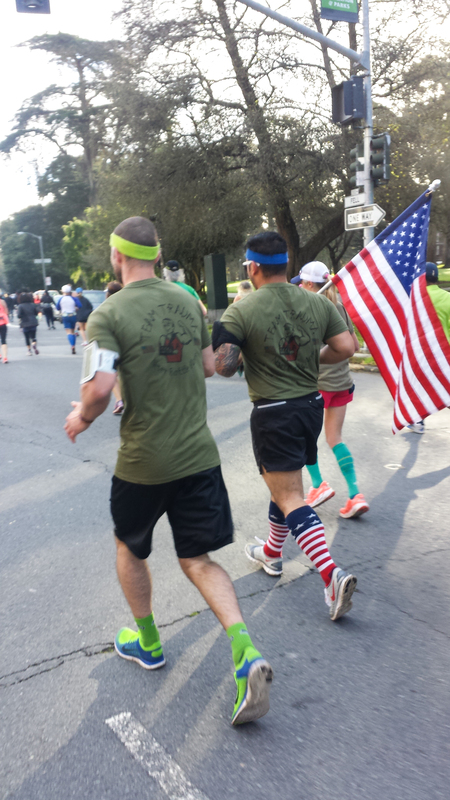 Instead of growing closer, the finish line seemed further away the longer I jogged. The Great Highway became an evil, desolate place. I didn’t want to quit, but I so wanted the pain to be over – right now – but it wasn’t over, nor did it seem that it ever would be. I slowed for water at the two drink stations along the Highway. Hydration, I knew, was important. But, not running – stopping, for Heaven’s sake! – when you haven’t prepared and your shoes are not broken in and YOU ARE HURT seemed a much more logical and health-conscious strategy. Still, I kept going. I wanted to see this through and I wanted to do it in about three hours. I did not want to give up. But, oh, how I longed to give up! Is that why I continued? Did I have such a heart, too? There was no other reason that came to mind. My heart said to continue; so I did. It made no more sense than that. The leg pain signaled that I was probably quite injured at this point. I could barely put one foot in front of the other. The “shin splint” was a much greater lacerating, stabbing agony now. Yet, just as the old man in Hemingway’s masterpiece was almost destroyed, almost defeated – certainly not triumphant – he simply just kept going. He made the conscious decision not to give up. Pain be damned. I had two – albeit cramping – feet. And, I had a heart, flagging and wavering, ready every second to just stop. I began fantasizing about the SF Muni and taking a bus back to the finish. But, instead, I focused on one step at a time, and kept faithful to that heart which wanted to give up and yet (for some strange reason) refused to do so. And – finally, and quite less than triumphantly, and, yes, very nearly defeated – I did cross the finish line – in three hours and two minutes – and limped into my daughter’s and her boyfriend’s arms. Sister-in-law Kristine: Yay!!! 13.1 !!!! Perhaps I just needed to finish it, to complete what seemed impossible for me. But, just like Santiago, who had Manolin, the young devoted boy waiting for him and whose love gave the old fisherman strength to go on, I had my family, supporting me the entire time, cheering me on, loving me, giving this humbled, not-so-old-lady the strength she needed to not completely falter and, if not to conquer the asphalt, to at least not let it conquer her. This entry was posted in Musings, The United States of America and tagged backyard travel, California Academy of Sciences, De Young Museum, Golden Gate Park, parking, San Francisco, Strybing Arboretum. Bookmark the permalink. Renate you made me cry. If you aren’t the sweetest person on eath then I don;t who it would be. Mary, I just had to sit with your comment for a little while and let it wash over me. Thank you so much, my friend. This post was a few months in the making because I was trying to figure the whole day out, trying to figure out how best to express what happened that day. And, you words help me know that perhaps that time was worth it. Much love to you. That brought tears. Loved your unconquerable spirit. Thank you, Darlene. Just, thank you. Your comment touches my heart. Love you, my friend. Beautiful connection to Old Man and the Sea. I was still having a hard time understanding why you didn’t just call me to pick you up…But now I get it. So proud of you. Thank you, my daughter. Just as I simply had to turn around to take that photo at the beginning of the story, I just had to finish what I had started. That’s all. Thank you for being there at the finishing line to catch me. How blessed I am to have you.